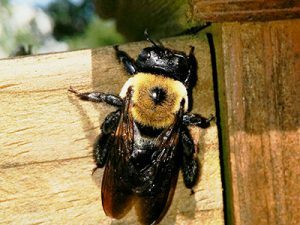 Carpenter bees are a real nuisance to homeowners throughout Connecticut. These bees are most active in May, June, and July, and often leave visible holes in wood. Carpenter bees are also known to hover around near the eaves of buildings. But no matter where or when you see them, carpenter bees can be a real pest. Although they do not cause structural damage, carpenter bees can cause an enormous amount of visual damage to your home’s fascia boards and soffits. In many homes, this damage is made worse by woodpeckers, who then peck at the wood looking for carpenter bee larva. Found throughout Connecticut, the eastern carpenter bee (Xylocopa virginica) is often confused with the bumble bee. They do look similar, but the carpenter bee is much larger and has a shiny black abdomen, while the smaller bumble bee has a yellow and black abdomen. And unlike the bumble bee, which lives in a colony with hundreds of other bees, carpenter bees are not social creatures. Male carpenter bees do not have stingers and are no threat to humans. They hover outside the nest and will occasionally dive at humans, but this is just a scare tactic. Female carpenter bees have stingers and will attack if provoked. The females chew the wood to make their nests, however, and spend relatively little time outside while building the nest. How do you treat for carpenter bees? Our professional technicians use a specialized dust that kills carpenter bees on contact. The dust is applied into the individual carpenter bee galleries along the roof line, deck areas, overhangs, or anywhere else carpenter bees have drilled new or existing galleries. Carpenter bee work can be difficult, but like all the services we offer, we’ve perfected it. When is the best time to treat for carpenter bees? Carpenter bees are best treated in the spring upon their first emergence. This is typically April through June. Our carpenter bee service will kill many of the female bees (which do all the damage). The males will continue to buzz around for a short while after the service is complete. How much does your carpenter bee service cost? Prices vary based upon how high up the bees are, the type of home, and the size of the home. Is there a warranty for carpenter bee treatment? Yes, all our carpenter bee work comes with a 6-month warranty. If you see dime-sized holes in the wood around your home or property, you likely have carpenter bees. We offer fast, effective treatment for carpenter bees that will keep them away from your home and your property. Call Envirocare Pest Control or contact us online for more information.